Ben Roethlisberger threw for 353 yards and three touchdowns to lead the Pittsburgh Steelers to a 30-27 victory over the Tampa Bay Buccaneers on Monday Night Football. Capping a tumultuous week in which star receiver Antonio Brown made headlines by shouting at an assistant coach on the sidelines and stirring talk of a trade on social media, the Steelers (1-1-1) built a 20-point lead before holding on for their first win. Vance McDonald scored on a 75-yard pass play and finished with four catches for 112 yards, while Brown and Ryan Switzer also had first-half touchdown receptions for Pittsburgh, who led 30-10 at half-time. The Steelers defense forced four turnovers, including three first-half interceptions - one returned for a touchdown - of Ryan Fitzpatrick, the 35-year-old journeyman who threw for 819 yards and eight touchdowns in two victories to open Tampa Bay's season. 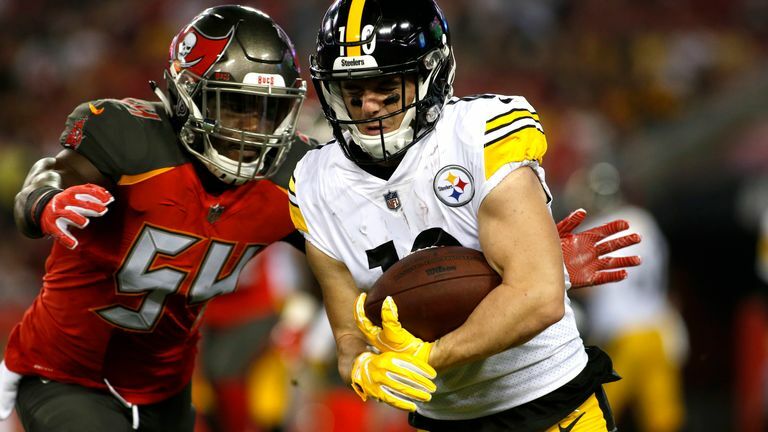 Fitzpatrick tossed fourth-quarter TD passes to Chris Godwin and Mike Evans to rally the Bucs (2-1) to within three points at 30-27, with still more than five minutes remaining but the Steelers ultimately held on for a vital win.